It’s been a week of sweets around here! The Indian festival of Diwali is on the 26th of October this year. As part of our celebrations, I’ve posted an Indian or Indian inspired dessert every day this week. All of them have incorporated seasonal, local ingredients. Looking back to the previous posts this week, I’ve realized that I came up with a way to make all of them healthier, typically with adding less sugar or using a ‘natural’ substitute. The beets, parsnip, applesauce all substituted for sugar and added great texture and crunch. I didn’t really set out to make this a healthy Diwali, but if I have to eat sweets five days in a row, they had better not be bad for me! Today’s recipe is Indian inspired rather than Indian. The recipe just came together on its own after I baked the sweet potato and was wondering what to make with it. You get yams in India but they are sweeter than the yams or sweet potatoes you get here. Jaggery is unrefined cane sugar. It is sometimes also made from palm sap. 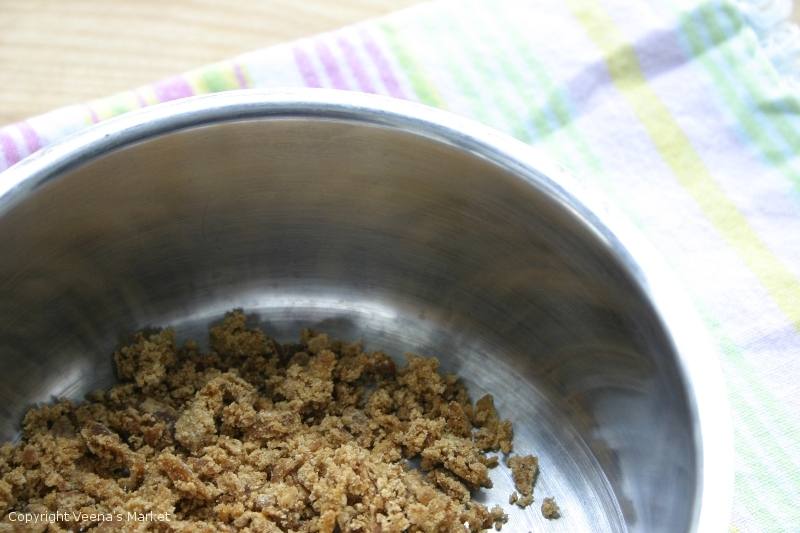 The flavor of jaggery is quite different from that of refined table sugar. 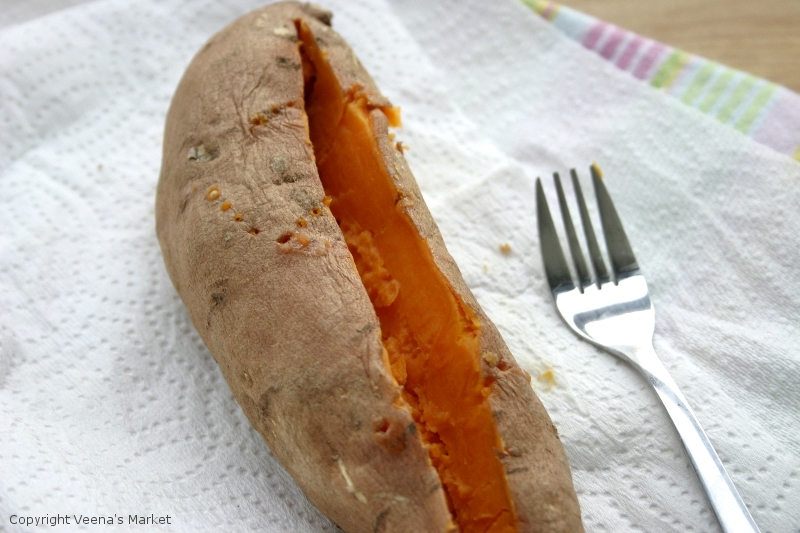 Pierce the sweet potato 3-4 times with a fork or knife. Cook on high for 8 minutes or till soft. Turn over half way through. Peel and dice into 1 inch cubes. Heat the ghee in a saucepan on medium heat. Toast the coconut chips for 4-5 minutes while stirring frequently. They should be lightly browned and crisp. 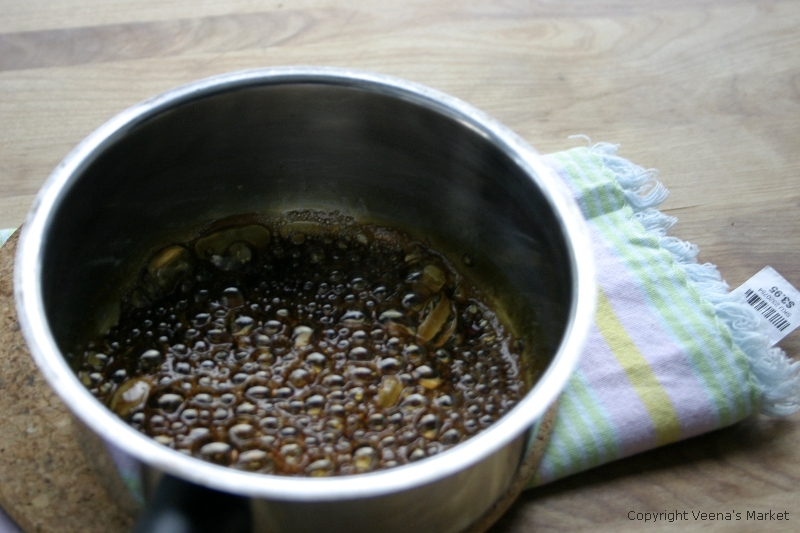 Heat the jaggery with 1/4 cup of water in a small pot over medium heat. Add cardamom pods. Bring to a boil and then simmer on low for 10 -15 minutes or till the sauce has reduced and is the consistency of maple syrup. If you need to, add more water. 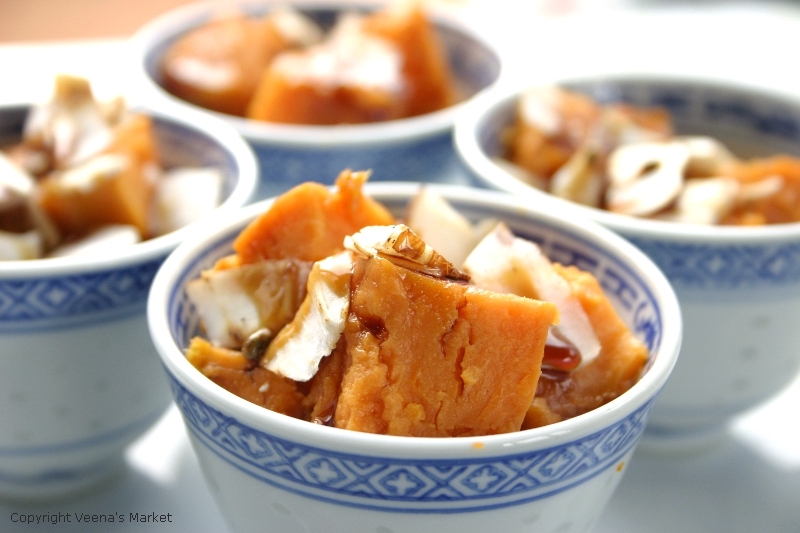 Mix the sweet potato and coconut chips and drizzle the jaggery sauce over them. This has been a very special week as I don’t often get to indulge in Indian sweets. Thanks for following along and Happy Diwali! It’s turning out to be one of those weeks when everything happens all at once. Deadlines, errands, events, looking for a new apartment. Not to mention all the work it took to find affordable flights to India for trip in December and the ensuing visa application. And oh yeah, dark gloomy weather when you’re trying to take pictures. Or I could just blame it on the pears that were of the perfect ripeness. Just asking to be eaten. So it came to be that I took the very popular Mango Lassi and made it with baked pears. Was it as good as the One Lassi? I’ll let you decide. Even with this simple recipe, I had to make a couple of tweaks from what I’d planned. I blended 2 pears with 1 cup of yogurt first and it turned out to be too much yogurt. I added another pear and some honey to make the lassi a bit sweet. Feel free to add sugar or more honey to your taste. 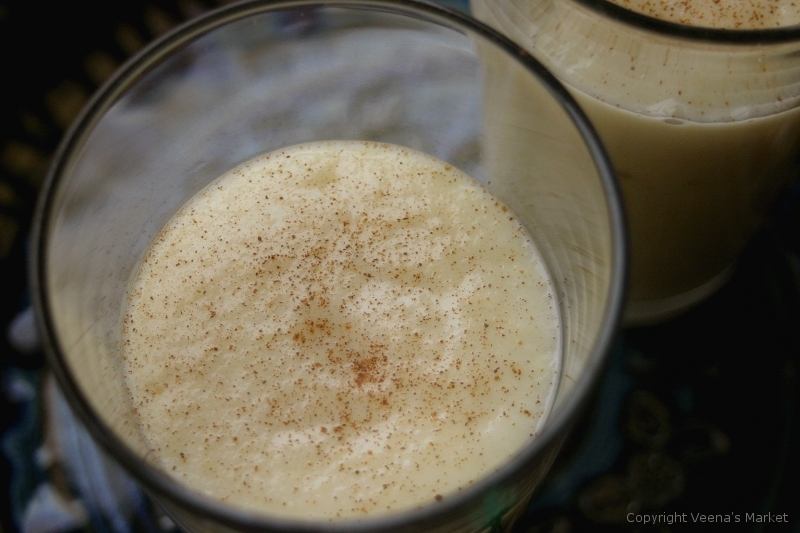 I always use freshly ground cardamom when making mango lassi. But the cardamom just didn’t pair well with the pear lassi. I ended up using ground cassia cinnamon instead. 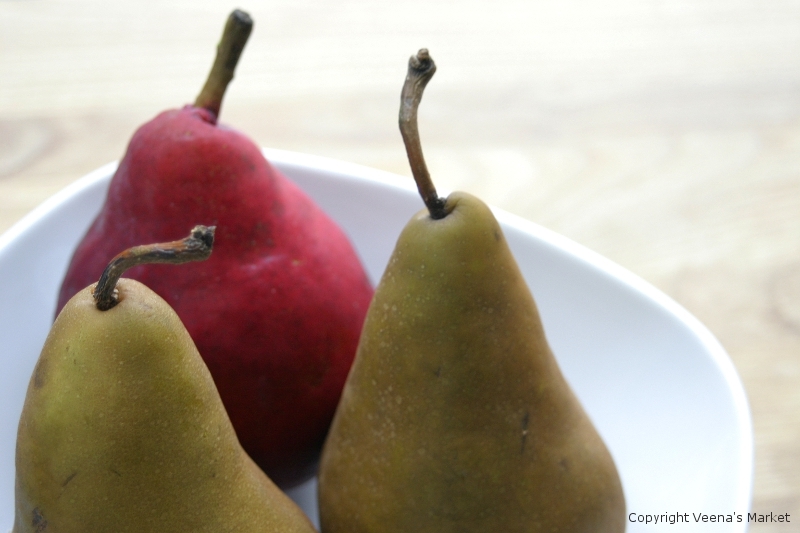 With a fork or knife, pierce the pears a few times each. 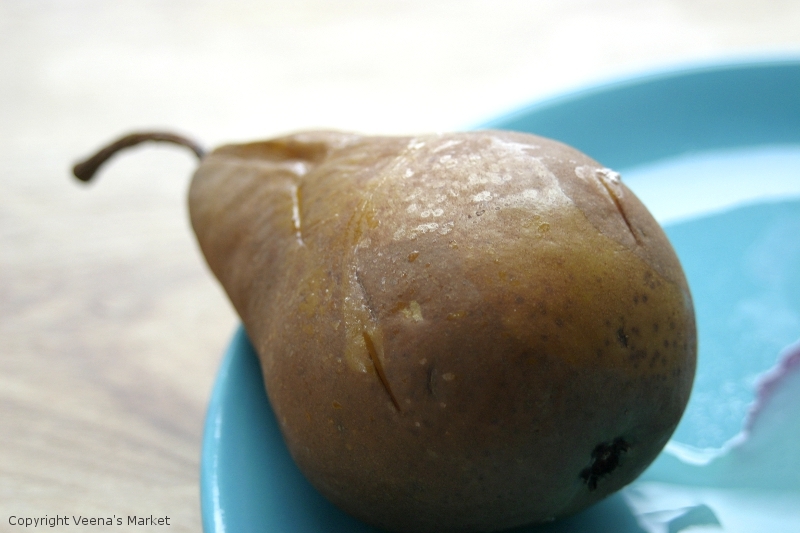 Microwave on 80% power for 10 minutes or till pears have softened. Flip them half way through. Peel, remove seeds and then blend with yogurt, ginger and honey. Pour into glasses and dust with the ground cinnamon. 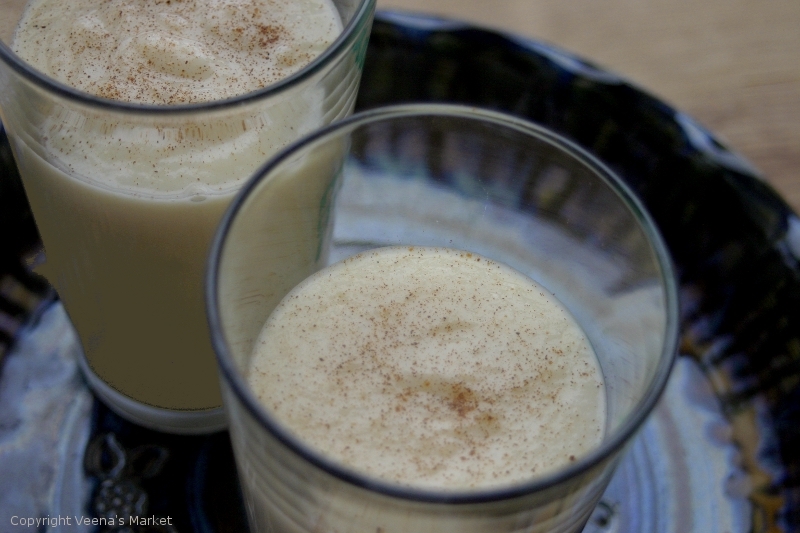 Sip and enjoy your dessert in a glass! And enjoy the rest of your week. I can’t wait for the weekend and to dream about all the places I”ll be visiting and all the food I’ll be eating in India! Diwali, the Indian festival of lights is on October 26th this year. This is one of the most popular festivals in India! Most people celebrate with fireworks, new clothes and families and friends exchange sweets. I’ll confess that I don’t often eat sweets. For one, they go directly to my waistline and for another, they usually have some ingredient that I can’t eat. Plus when I crave food, its usually something savory. I really dislike how sickly sweet most Indian sweets are. BUT, when you make it yourself, you’re in control. And with healthy ingredients like beets, I don’t feel guilty at all. I love the natural sweetness of the beets and didn’t feel the need to add much sugar at all. There are layers of texture in this simple dessert. The cooked grated beets still retain some of their crunch. The roasted cashews are crisp. The raisins plump up when cooked with the beets and milk and are almost juicy when you bite into them. Beets are in peak season right now and there are so many ways of preparing them apart from slicing them up for a salad. I love beets but hate the mess of cleaning up after them! 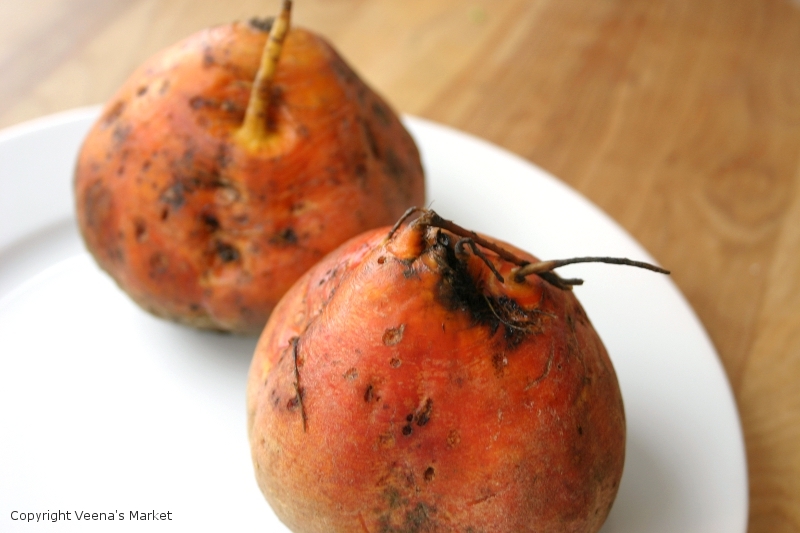 Golden beets though come with all the crunch of beets, a mild sweet flavor and none of the mess. 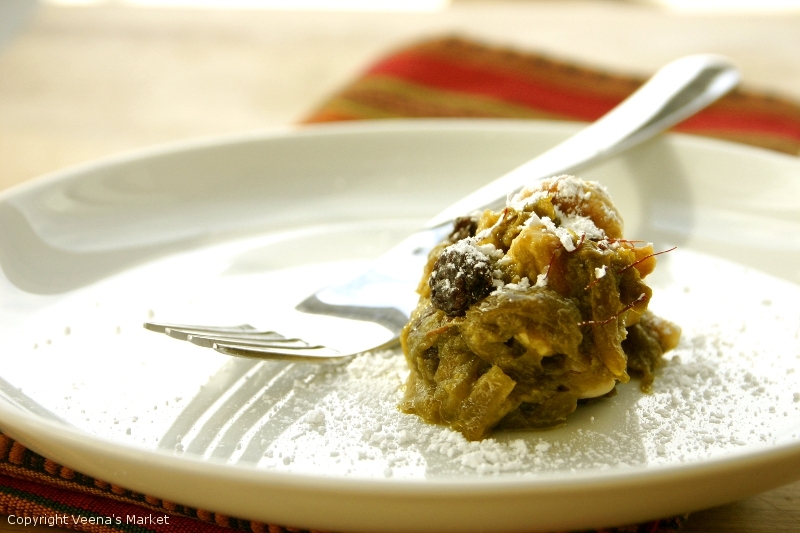 So here goes, the first recipe for this week of daily Diwali dessert inspiration! 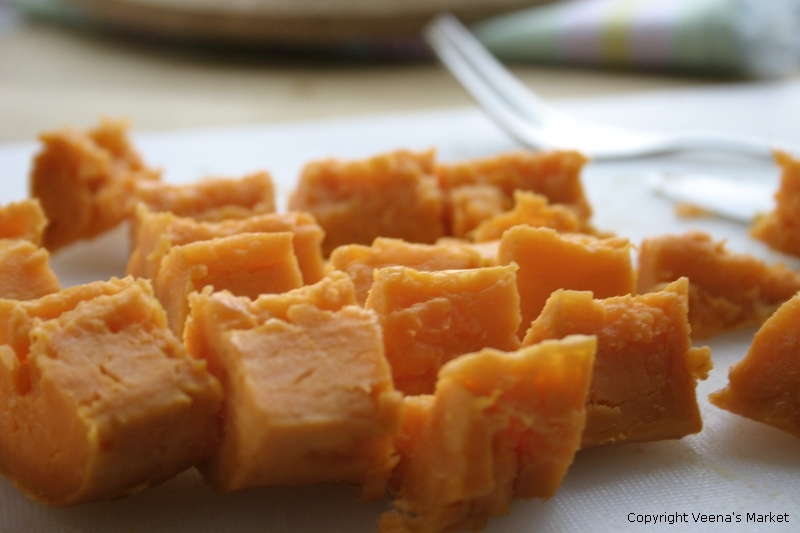 This recipe is a take on carrot halwa. Heat 2 teaspoons ghee over medium heat till it melts and starts to froth. 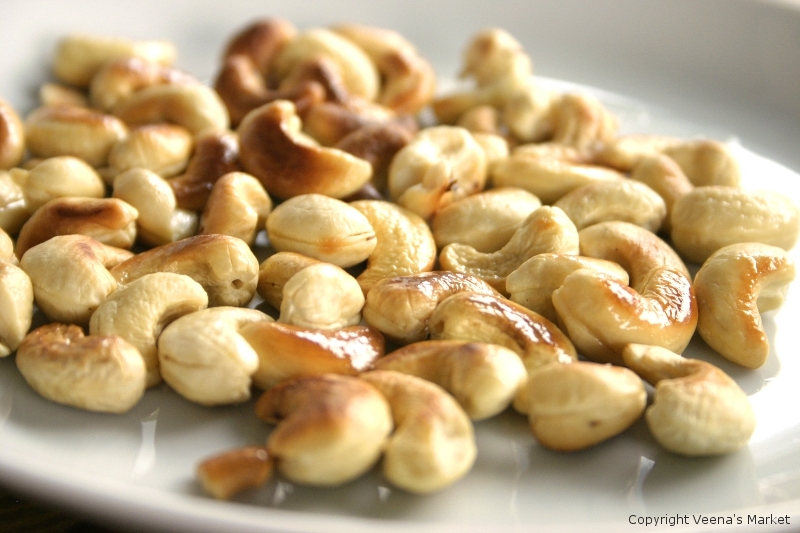 Roast the cashews for 3-5 minutes or till slightly brown. Remove from heat and allow to cool and crisp up. Microwave 1/2 cup milk for 30 seconds. Gently crush saffron in your palms and add it to the milk. Stir and let sit for a few minutes. Heat 2 tablespoons ghee in a pot over medium heat till it starts to froth. Saute the grated beets for 3 minutes. Add the milk with saffron, the rest of the milk, raisins and sugar. Stir. Simmer on low heat for 20 minutes. The beets should be cooked but still have some bite to them. Allow to cool for 10 minutes, garnish with the roasted nuts before serving. For a nice presentation, you can dust with powdered sugar.